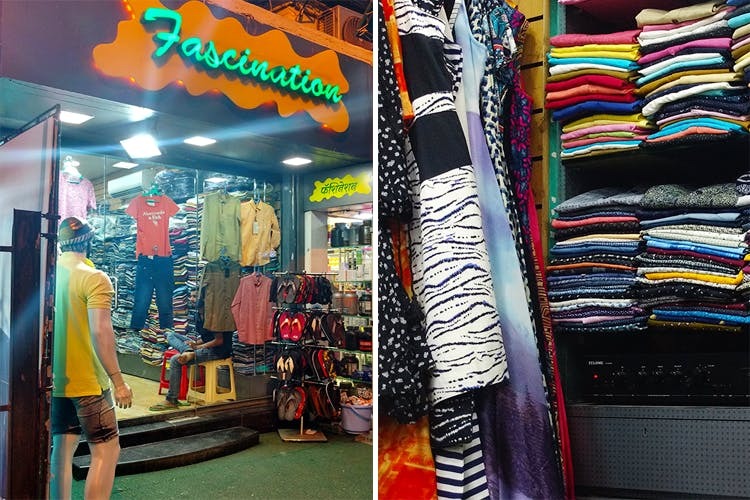 Fascination is an export shop bang opposite Mehboob Studio that sells branded apparel and accessories at reasonable prices. We decided to go in and check it out! Fascination has been sourcing export brands for over 27 years. Be it jeans, jackets, casual and formal shirts, t-shirts, jerseys or pyjamas – they have it all. Accessories, casual wear, shirts, t-shirts, boxers and more. Women can stock up on leggings, bags, tops, shrugs and more.The shop attendants are helpful and will take you through the stock. There are branded labels, export stuff and some homegrown brands that you’ll find here. The quality of clothes in no less than what you’ll find at a mall and the prints are more that what you’ll find at a branded store. The collection for tops for women start at INE 650, t-shirts for men start at INR 450, shirts at INR 750 upward and chinos & jeans from INR 1,200 upward. If you love cartoon boxers, night clothes and even tops and t-shirts, this is one place you should definitely check out, as the options are limitless.